For centuries humanity has gazed at the sea, rivers and rambling brooks in awe of water currents and the energy potential they hold. With increasingly critical demand for safe renewable energy solutions, our ability to capture water power has been an abstruse, distant choice for mitigating our dependence on fossil fuels. Now with Peak Oil and Climate Change concerns igniting our interest in renewable energies, our brightest, most creative thinkers the world-over turn their attention and intention toward creating efficient, sustainable and safe renewable energy capture devices. It’s understood best bets for generating constant electricity straddle natural energy sources: the sun, the wind and the tides, with the energy captured from water and the tides currently garnering longest odds. Water power, known more formally as hydrokinetic energy, is based on hydro, meaning water, and kinetic with roots in Greek, κίνηση, or kinesis, meaning motion. The motion of water and study of it includes capturing its power. At the heart of this energy is spinning and flowing, ironically a strikingly dissimilar concept from capture. Thus, as an example, one Florida inlet having an average tidal change between 2” up to 1’ carries 75 trillion Cu-Ft of fast moving water every tide. Furthermore, hydrokinetic energy offers consistent yields and potentials unknown and possibly undiscoverable from other naturally-sourced energy. Wind power faces insufficient, constant wind to return the capital investment, even with government subsidies, and robust solar energy opportunities are mostly located in far, off grid locales. Traditional hydrokinetic solutions include tidal turbines, wave buoys, wave hubs, tethered ocean, buoyant/flexible wave snakes and tidal stream machines that generate electricity yet also create gross negative impacts on marine wildlife and the environment. These solutions must overcome fundamental issues like potential fish or turtle kill, corrosion and tethering issues, repair distance and processes, long-term durability in water/weather, noise pollution and super expensive grid connections that are also environmentally damaging. Seems that when we embrace and mimic nature in creating organically-derived energy capture tools, the harmonious capacity of the design inherently overcomes the problems of other inelegant hydrokinetic systems. Over the last two years, W. S. “Scotty” Anderson, Jr. may have either consciously or unconsciously designed along these lines as he victoriously led his team to invent and build the ECO-Auger™. You’ll find information on this and other cool inventions at Anderson’s laboratory, www.smartproductinnovations.com. As a lifelong fisherman, Anderson designed his hydrokinetic system to convert energy from moving water, delivering renewable, sustainable energy, while completely safe for fish and marine wildlife. The tapered helix permits fish and other marine life to pass through with absolutely no sharp edges to injure them. Even turtles can swim through or are gently pushed aside as the ECO-Auger generally rotates under 100 rpm. The tapered design also permits debris to pass. The ECO-Auger is a double-helix, auger-shaped spinner regulated by the size of the radius and the strength of the water current. “It’s easy to array, bi-directional and housed in an individual, streamlined single form,” Anderson points out. Anderson originally envisioned the ECO-Auger “simply installed under bridges between the arches of bridges, housed on the ECO-Sled, a sort of a pontoon boat like a floating dry-dock.” This permits easy launch and retrieval for maintenance or if/when the ice gets too thick. This novel approach is so very different to existing technology. So very different and innovative that in late September 2009 Anderson’s team won First Place in the ConocoPhillips Energy Prize, a joint initiative of ConocoPhillips and Penn State University recognizing new ideas and original, actionable solutions that help improve the way the US develops and uses energy. The ECO-Auger rotates in either direction from the moving water and current and is directly transferred through planetary gears to a high-pressure hydraulic pump located in the machine’s nose cone. The nose cone, which is physically tethered to bridges by cables, or anchored in moving water, stabilizes the torque generated from the rotation and transfers it to a hydraulic pump. The pump supplies variable volumes of high-pressure fluid at controlled, set pressure, regardless of the direction or speed of rotations. This pressure turns an oil-driven electric generator that delivers stable electrical current. Thus, constant power is generated through the ECO-Auger’s unique hydraulic circuit. As the ECO-Auger rotates, the high-pressure oil flows through check valves to an array of standard air oil accumulators that are connected directly in line to the oil motor driving the electric generator. The oil to the electric generator is sized below the maximum gallons per minute of the ECO-Auger’s hydraulic pump, allowing the pumped oil to be supplied to the motor, while the excess volume is stored in the accumulator. A computer-monitored storage system assures maximum energy stability, storing energy and supplying the generators during the slow down of tidal flow. Since the ECO-Auger is bi-directional, it is well-suited for high velocity, coastal ocean and bay locations. Near the ocean, the generation hydraulic system uses nitrogen-over-oil accumulators to maintain power generation during ebb tides or slack tidal movement under 1 knot (0.5m/s). 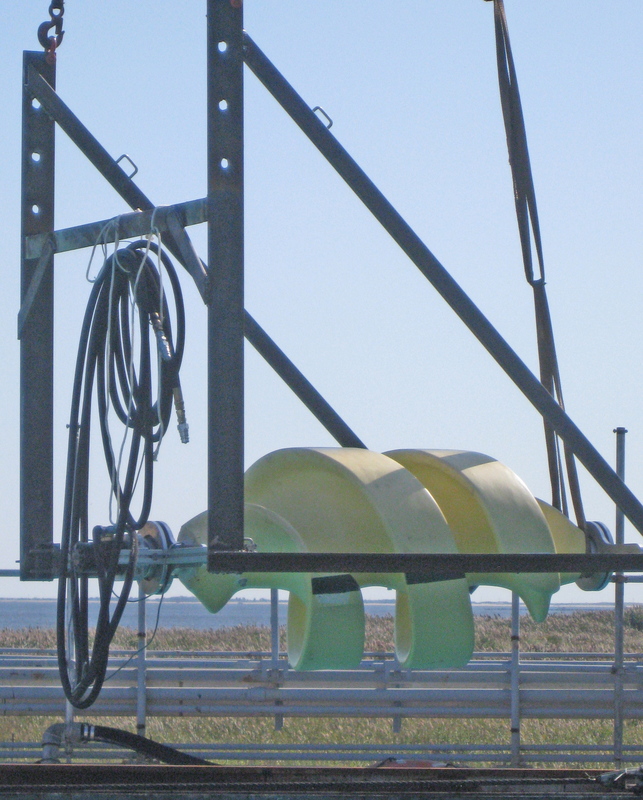 Each potential installation of the ECO-Auger is unique, requiring the water velocity and profile or depth of the installed area to be fully studied and documented. Anderson recommends a month-long study to support 30-year energy capture forecasts and projections. River installations of the ECO-Auger are successful when current is in excess of 3 kts (1.5 meters/sec). The accumulators mentioned above are not required in mono-flow installations and installation reflects this cost savings. With the mono-directional ECO-Auger, electricity can be generated already existing power dams, downstream in any dam outlet, discharge from municipal water treatment facility, cooling water discharge and many river bridge options. The ECO-Auger in its recent First Place win in the 2009 ConocoPhillips Energy Prize, a joint initiative of ConocoPhillips and Penn State University — won specifically for its new, original idea improving the way the U.S. creates and uses energy. Anderson and his team are up to this important challenge and set their sights on installing this remarkable fish-friendly, economical, high-yielding hydrokinetic solution in a river, alongside a bridge or coastal inlet near you. SAN FRANCISCO – California released a draft plan on Thursday to reduce the state’s projected greenhouse gas emissions by nearly one-third, in part by creating a cap and trade program that could serve as a blueprint for a national carbon emissions market. The 77-page “climate change draft scoping plan” lays out the framework for California to meet the goals of a 2006 law signed by Gov. Arnold Schwarzenegger that requires the state to slash its greenhouse gas emissions to 1990 levels by 2020. This target means electric utilities, industrial users, fuel refiners such as Chevron Corp. and ConocoPhillips and builders will have to lower their combined output of carbon dioxide by one-tenth from today’s levels and 30% from projected 2020 emissions of the gas thought to contribute to global warming. The success of California’s efforts to scale back greenhouse gas emissions using a mix of regulations and market mechanisms could provide a roadmap for a national standard, largely thanks to the state’s size and the aggressive goals it has set. “It certainly paves the way,” said Milo Sjardin, head of the North American division of New Carbon Finance, a carbon emissions research and analysis firm. “Any federal program may take some of California’s experience on board,” he said. The California plan also seeks to expand the amount of electricity utilities such as PG&E Corp. and Edison International generate from renewable resources to 33% by 2020. Today, just 12% of the state’s electricity comes from wind, solar, geothermal and other renewable sources. The nation’s most populous state says it will achieve these ambitious goals by putting in place strict limits on greenhouse gas emissions, caps that give users of fossil fuel a financial incentive to put in place heavier pollution controls. A key part of this plan is the establishment of a market to allow companies to trade their carbon allowances with companies from neighboring Western states and Canadian provinces that are producing less than their allowed emissions — or that engage in an activity, such as planting trees, that lowers emissions. The head of the panel charged with implementing the state’s global warming law said board members are using as a model the cap-and-trade program established by the U.S. government to restrict emissions that cause acid rain, which was part of the 1990 Clean Air Act. “When industry knew they had to come under a cap, they came up with measures that were much cheaper than anyone thought,” said Mary Nichols, chairman of the California Air Resources Board. “Having a cap out there spurs the innovation,” she said in a conference call with reporters. California’s cap and trade program, set for launch in 2012, will also present national companies with a second set of standards with which to comply. A group of Northeastern states is planning to launch a smaller cap and trade program next year. The addition of another set of regulations “puts increasing pressure on the federal government to put something in place to level the playing field,” said New Carbon Finance’s Sjardin. Sens. Joseph Lieberman, an independent from Connecticut and John Warner, a Republican from Virginia, last year introduced a national climate bill – which the Senate tabled in June — designed to cut greenhouse-gas emissions by 70% by 2050. Both major-party presumptive presidential candidates, Republican Sen. John McCain and Democratic Sen. Barack Obama have said they support a national standard for carbon emissions. Development of a U.S. carbon-trading market is following the rapid growth of the now $50 billion carbon-trading market in Europe, where corporations have been trading emissions-reductions credits as part of meeting the Kyoto Protocol. California’s market will likely start at a much smaller level. New Carbon Finance’s Sjardin estimates it could reach $10 billion by 2015. If the entire country were to incorporate such a program, the size of the market could hit $1 trillion by 2020, he says. Bringing to fruition California’s plan, let alone a national version, faces stumbling blocks. In the state’s Senate, the Republican caucus is pushing for a delay of certain parts of the 2006 bill it says make it too expensive for businesses in a time of economic duress. Nonetheless, the state’s largest utilities are preparing for the state to push through the caps, which will cover 85% of California’s greenhouse gas emissions. San Francisco-based utility PG&E says 13% of its power comes from renewable energy sources. By 2012, that level should reach about 22%, said Keely Wachs, a spokesman for the utility, which serves 15 million customers in Northern and Central California.